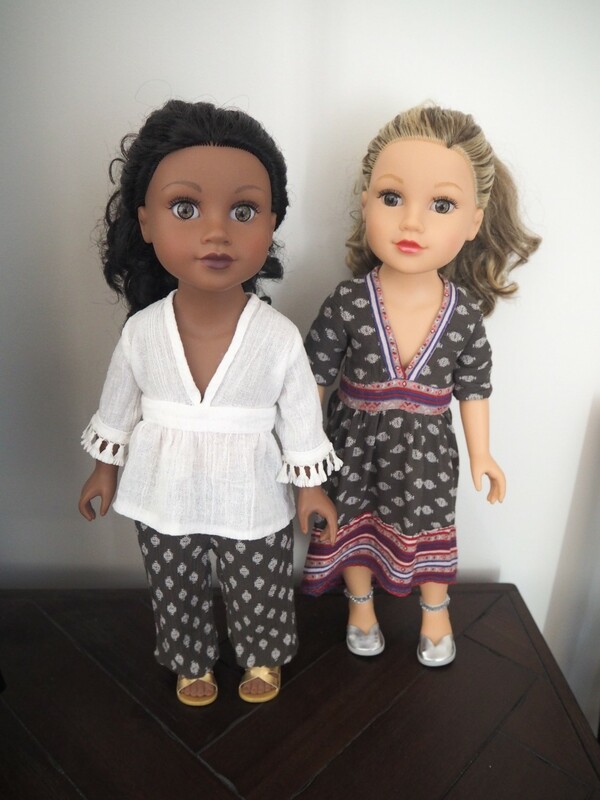 Featured in both the Outback Libby: Killara outfit and the Outback Libby: Lightning Ridge outfit, this new Liberty Jane® PDF pattern designed to fit 18 inch American Girl® dolls will be a great addition to your dolls wardrobe! Pattern includes 3 designs: The Killara dress, the Lightning Ridge top, Sleeveless Arm Binding variation (can be used with top or dress) and the low scoop tank top to wear underneath. Your doll will love wearing this deep V-front dress with the high-low hem. This softly draped dress has a fitted bodice with front neck binding and elbow length sleeves finished with an elastic casing. Depending on your fabric, you can choose to have a single or double layer skirt. We chose to have a double layer for our Killara dress made from a beautiful printed silk chiffon. Suggested fabrics also include challis and a soft, lightweight cotton batiste. Skill Level: Intermediate. You will need the basic understanding of how to use a sewing machine and be familiar with sewing straight seams. Finishing techniques are shown/ explained. I made both the the dress and top . The pattern was easy to follow. I really liked the border and was able to buy a print which worked well to create a border. I added fringing to the cheese cloth top- it looked great. Super cute and sized perfectly. I used a lightweight burnout voile. I have made this dress several times and have made even as a top twice. Instructions are great. Nice work! I have made 3 dresses, 1 with the overskirt, with this pattern. It goes together easily and turns out well. I made a mistake on the first dress and put the skirt on upside down. It turned out the same as the other 2! You need to make a tank or petticoat for under the low v neck. Thank you for this free Friday pattern. I love the dress and the instructions were great. Keep up the good work.